Nutrition and health claims must be approved before they can be used on foods. 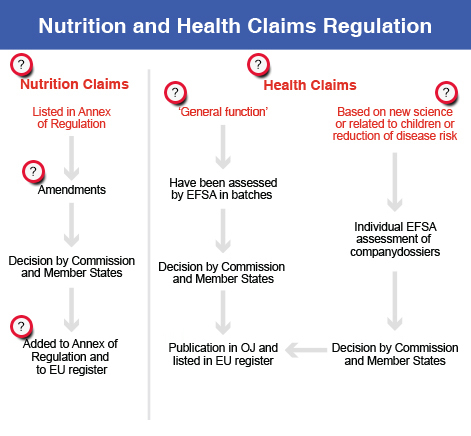 Nutrition claims are listed at the end of the Claims Regulation; health claims are listed in separate regulations. All claims are also listed on the EU Register. Roll over the question marks to find out more. Scroll down the page to find out more. These are about what's in the food, for instance 'source of fibre', 'reduced salt'. These suggest a relationship between the food, or something in it, and health. Examples are 'Niacin contributes to normal energy-yielding metabolism' or 'Sugar-free chewing gum helps neutralise plaque acids. Plaque acids are a risk factor in the development of dental caries'. There is a legal mechanism to amend the list of permitted nutrition claims. Claims may be added, removed or conditions changed. For example, 'no added salt' was added to the list in 2012. These health claims are well-established and understood with a firm scientific basis, such as 'Iron contributes to normal formation of red blood cells and haemoglobin'. These health claims are either based on new scientific data, can be emotive as they refer to children, or are quite far-reaching as they refer to a disease state. Only limited numbers have been authorised so far. An example of a claim referring to children is 'Calcium is needed for normal growth and development of bone in children'. There is a freely available online EU register of claims. This includes all the details of permitted nutrition and health claims as well as lists of rejected health claims with brief explanations of the reasons for the rejections.